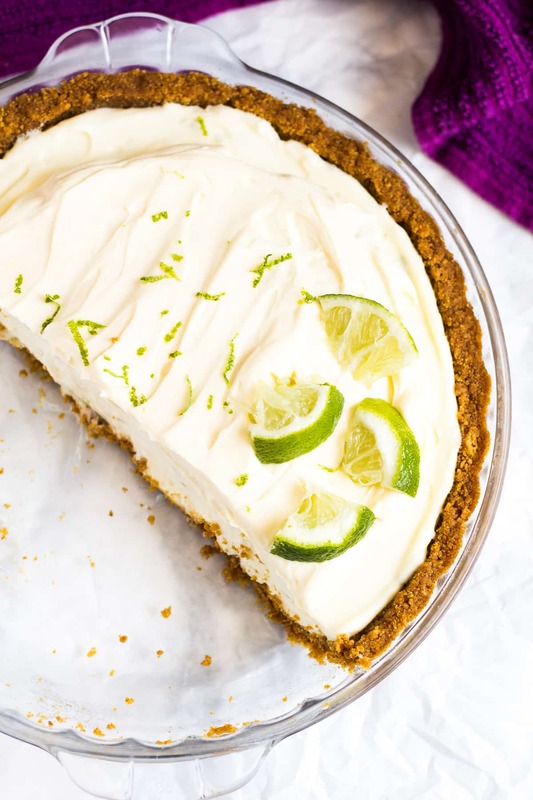 No-Bake Key Lime Pie – A deliciously creamy key lime pie with a crunchy ginger crust is a match made in heaven. Top with fresh whipped cream and lime slices for the ultimate refreshing Summer dessert! Today’s recipe is about as zesty, and summery as you can get. Oh, and it’s no-bake! I bring you my recipe for No-Bake Key Lime Pie. 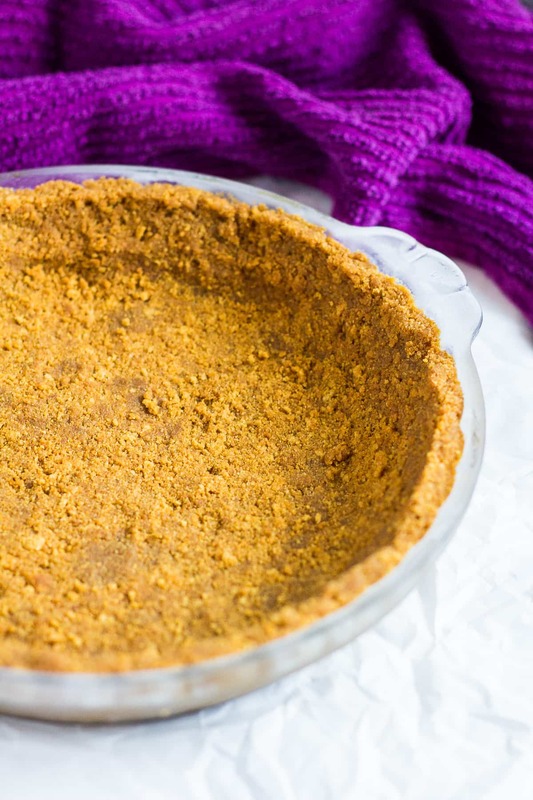 A creamy, delicious lime-infused pie with a crunchy gingernut/gingersnap crust. 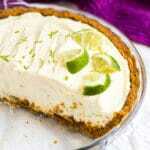 This key lime pie recipe with its ginger crust is truly a match made in heaven, they pair so perfectly well together. This is the perfect no-bake dessert to serve up in the summer-time. It’s super indulgent and refreshing, everyone will be going back for seconds! 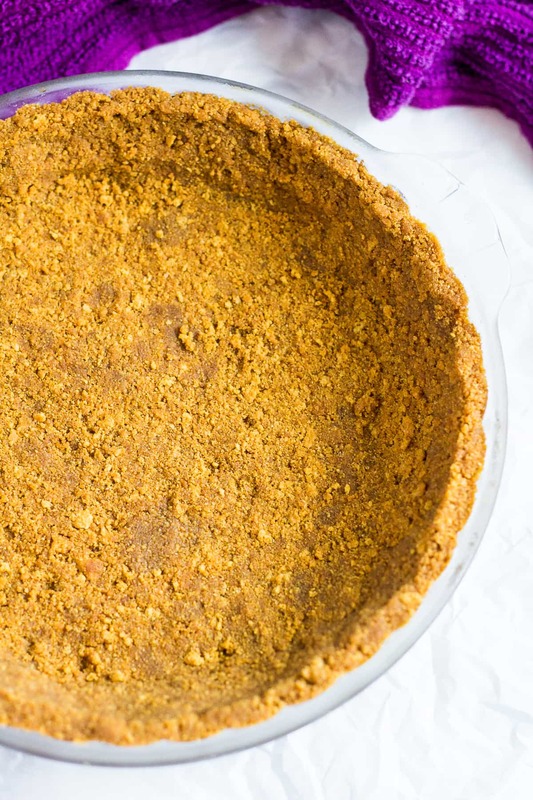 To make this no-bake pie, start by stirring together the biscuit crumbs and melted butter. Press the crumb mixture into the bottom and up the sides of an ungreased 9-inch pie dish/springform pan, and keep in the freezer whilst preparing the filling. For the filling, whip the heavy cream to stiff peaks. In a separate bowl, whisk together the condensed milk, lime juice, and zest, then gently fold in the whipped cream. Pour the filling over the crust, and smooth out the top. Refrigerate until set – at least 3 – 4 hours, preferably overnight. For the topping, whip the heavy cream until it starts to thicken. Add the icing sugar and vanilla and whip until stiff peeks form. Spoon the cream on top of the pie, and garnish with lime slices. paired with a crunchy ginger base – a perfect combination! How long will this Key Lime Pie last? This pie can be covered and kept in the fridge for up to 2 – 3 days. 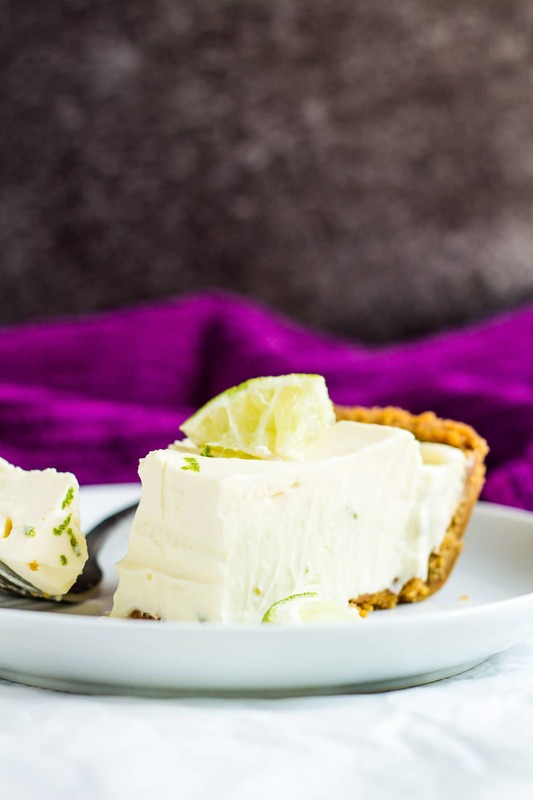 Can I freeze this no-bake Key Lime Pie? Yep! This pie also freezes well for up to 2 – 3 months. Thaw overnight in the fridge before topping with whipped cream and serving. Try these no-bake desserts next! 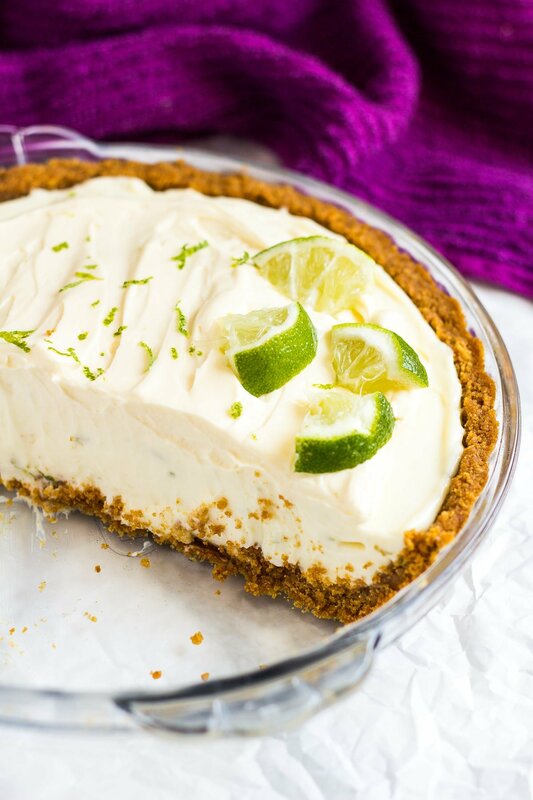 A deliciously creamy key lime pie with a crunchy ginger crust is a match made in heaven. Top with fresh whipped cream and lime slices for the ultimate refreshing Summer dessert! Stir together the biscuit crumbs and melted butter. Press the mixture into the bottom and up the sides of an ungreased 9-inch pie dish*, and freeze whilst preparing the filling. Using a handheld or stand mixer fitted with the whisk attachment, whip the heavy cream to stiff peaks. In a separate bowl, whisk together the condensed milk, lime juice, and zest. Gently fold in the whipped cream. Pour the filling over the crust, and smooth out the top. Refrigerate until set - at least 3 hours or overnight. Using a handheld or stand mixer fitted with the whisk attachment, whip the heavy cream until it starts to thicken. Add the icing sugar and vanilla, and whip until stiff peeks form. Transfer the whipped cream to a piping bag and pipe swirls on top of the pie, or simply spoon the cream on top. Garnish with lime slices and zest! Leftovers keep fresh refrigerated for up to 2 - 3 days. This pie also freezes well for up to 2 - 3 months. Thaw overnight in the fridge before topping and serving. *You can use a pie dish as pictured, but if you want super neat slices, I highly recommend using a loose-bottomed pan, such as a springform pan, as the pie is very creamy and delicate. Hi Marsha, not to be negative – you really should have considered calling your pie either a “No-Bake Persian or Tahitian Lime Pie” based on the recipe calling for LARGE limes. I may have misunderstood – did you mean 6 large KEY LIMES? What is ‘heavy cream’ ? Heavy cream is double cream, or whipping cream. Loved this! I used a coconut flour pie crust though in a square dish. My family loved it and the pieces came out beautifully! Can I use lemons instead of limes? ?